Sensationally stripy, this Elle sock twin pack has not one, but two pairs of stunning striped pattern knee high socks. Both sock styles mix narrow and wide multicoloured banding and are made with a Cotton rich blend of yarns, including Polyester and Elastane for durability and stretch. 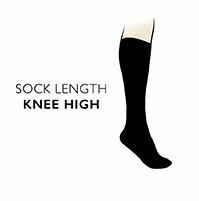 The socks have long ribbed tops that can be folded over or used full length and, like all good quality socks, hand linked toes for smooth seams for comfort. So, if you’re in the market for long, stripy legs, with added comfort and class, these will be just about your perfect socks!